Click any image of this 1932 Ford Sedan to engage HD Image Gallery. Gateway Classic Cars of Las Vegas is proud to present this one of a kind 1932 Ford 2Dr Sedan for sale in our Las Vegas showroom. This 1932 Ford is a steel body car with a black canvas top and beautiful lavender paint that pops with flames that flow backwards and wrap around the car. The interior is fully upholstered with gray leather bucket seats that have simulated snakeskin inserts, tilt steering column, Billet Specialties steering wheel, white face gauges, and a custom shifter knob that matches the door handles. This 1932 Ford for sale has a Chevy 383 stroker motor that is putting out 440 horsepower and is backed by a turbo 400 automatic transmission. 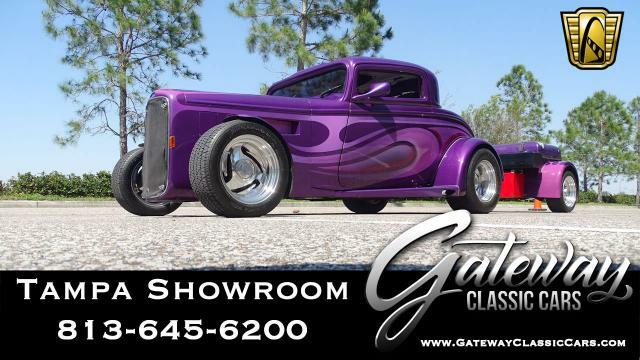 This 1932 Ford for sale has a Ford rear end with 3:73 gears that drive the massive Mickey Thompson's out back. The chassis is boxed and painted to match the killer paint on the car with front chrome shocks, and a chrome 4 link suspension with adjustable coil over shocks in the rear. 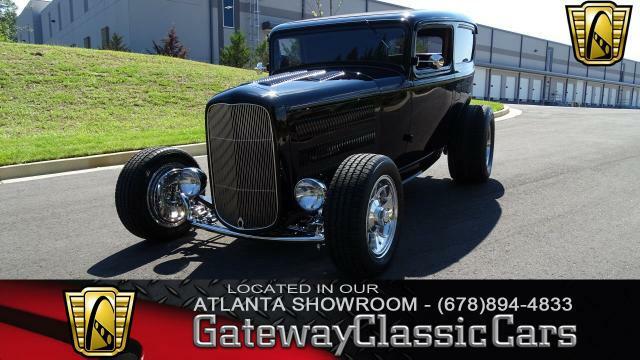 Options for this 1932 Ford for sale include: AM/FM Alpine CD Player, Power windows, Tilt wheel, Keyless entry, Leather interior, Radial tires, and Racing wheels.